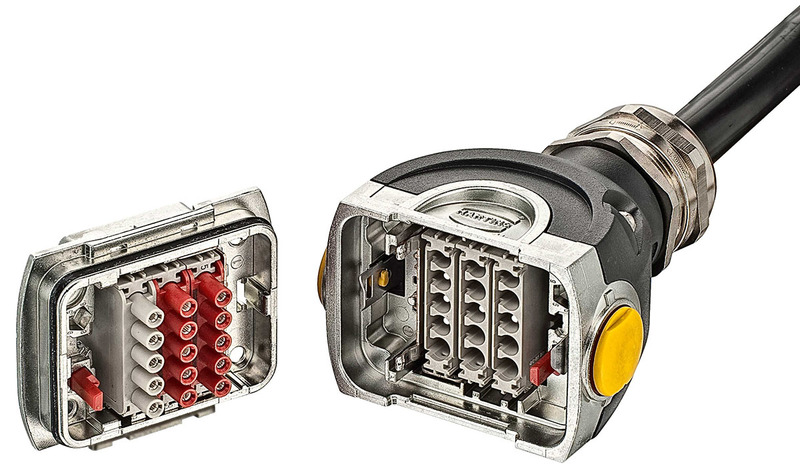 Han-Yellock® is flexible, offers utmost safety and reliability. unburdens highly complex technical components such as switch cabinets and requires practically no tools for assembly. Han-Yellock® is a comprehensive concept that offers more than just the actual components because it adds solutions for mounting material and housing labelling and a tool for producing the sheet metal cut-outs. That is not plug-compatible with the known Han A® or Han® B sub-assemblies. In addition to a housing in new sizes, it also includes three different contact insert systems. This new design is an expression of functionality - the Han-Yellock® offers connection technology that matches the surface to the functions. The design is as functional as the exterior is elegant.